It’s the most wonderful time of the year! Get into the Christmas spirit and try this gorgeous edible decor piece to add seasonal sparkle to your table. Bound to wow your guests, these chips look a lot more tricky to churn out than they actually are. Tell your guests how carefully you individually crafted each shape… our lips are sealed! 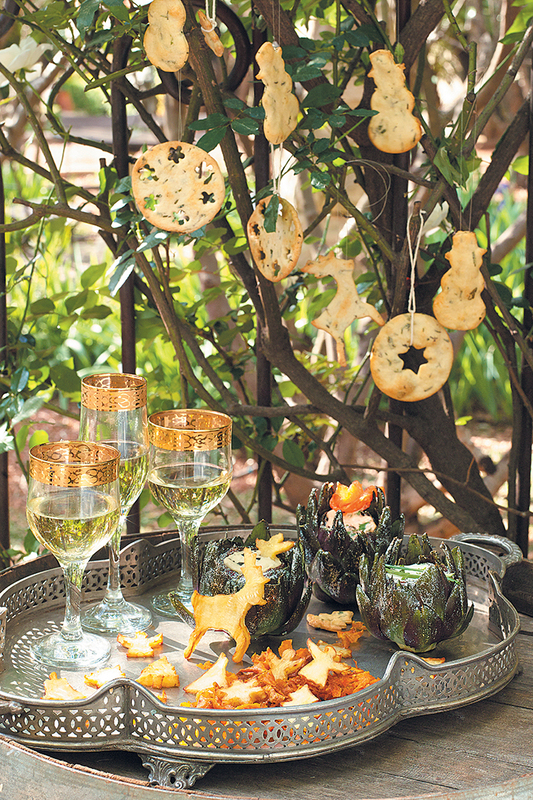 For the chips, use festive-themed cookie cutters to cut out different shapes from the potato slices. Heat the oil in a deep-fryer or deep pot to 180°C and fry the shapes, 15 – 20 minutes, taking care not to burn them. Remove with a slotted spoon and drain on paper towel. Repeat with the shaved carrot, reducing cooking time to 5 minutes. For each dip, blitz together all the respective dip ingredients in a food processer until combined, 5 minutes. Season to taste. Fill each cleaned artichoke with a dip, using them as ‘bowls’. Serve with the festive chips.